I've noticed a lot of peculiar claims in regards to "The Doomsday Machine" lately, most notably from the SD.Net denizens . . . claims which suggest that the claimants never saw the episode. This is disheartening, given that it's one of the better TOS episodes and an ever-present member of any fan-favorite list. This article is intended to help clear up some of the confusion regarding the episode. A synopsis of the tale is available here, and is recommended reading for this page. 1. At the end of the episode, the Constellation's engines are overloaded. What exploded? Though some have tried to claim that the Constellation's warp core was detonated, it was in fact the ship's impulse engines, as clearly indicated in dialogue. Kirk has Scotty rig the impulse engines to overload via a delayed detonation device, with the arming and countdown activated from the Auxiliary Control room from which Kirk controlled the Constellation. 2. Why didn't Kirk blow up the warp core? The Constellation's antimatter had been "deactivated" by the Doomsday Machine, meaning that the warp power system was rendered completely inert. 3. Why not just use photon torpedoes? Were they less powerful than an overloaded impulse reactor? Torpedoes, like the warp core, use antimatter. With antimatter being rendered inert, photon torpedoes would've been little more than kinetic energy weapons. Given that the Doomsday Machine was consuming planetary material while chasing the Enterprise, it doesn't make sense to conclude that a kinetic strike would've been of any value. So in a sense, the answer to the second question is 'yes', provided one recognizes the context of the episode. However, some have tried to use the 'yes' while ignoring the context, which is not rational. 3a. Kirk orders the warp drive repaired at the end of the episode. How could he hope to go anywhere without antimatter to power the warp engines? This question obviously isn't one that's been asked, since it involves having watching the episode. That said, however, it was worth including since someone might actually watch it, and wonder. antimatter storage facility. Deck 36 . . "
Amb. : "What is the mass flow rate of the antimatter replenishment stream to the containment pods." Worf: "Excus . . ."
Amb. : "The antimatter replenishment rate, what is it?" Worf: "I am not certain of the exact rate, there is . . ."
Is there evidence for such a system aboard starships of the 2260's? Yes, but not so direct as the statements above. In "The Mark of Gideon"[TOS3], Kirk finds that he and an alien are trapped aboard what he believes to be the Enterprise, travelling at sublight. In discussing how long they could live that way, Kirk informs her that they have provisions for 430 over five years, which should be sufficient. And, he says "power, that's no problem: it regenerates". 4. The explosion of an impulse engine is 97.835 megatons according to Spock. This means that it only takes 100 megatons or so to completely destroy a Constitution Class Starship. Actually, there are several ways in which that isn't correct. First, when Kirk is formulating his plan to ram the Constellation down the planet-killer's throat, he asks Spock: "Am I correct in assuming that a fusion explosion of 97 megatons will result if a starship impulse engine is overloaded?" Note the singular . . . Kirk is asking about a lone reactor, but orders Scotty to rig the "impulse engines" to overload, and tells Spock he'll be blowing the "impulse engines". How many impulse reactors (or impulse engines, if not the same thing in this context) does a Constitution Class Starship have? There's no way to be sure. 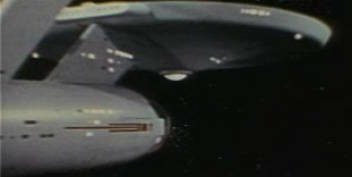 The ship was often shown with two apertures on the rear assembly of the saucer, but just as often was shown with numerous apertures in a line across the entire assembly (especially in the "riding off into the starlight" shot at the end of episodes, or the similar shot from the credits, both of which are in "Doomsday..."). Dialog from "Obsession" indicates no less than two impulse engines, whereas "Catspaw", wherein the impulse engines were being used to defeat a forcefield surrounding the ship, implies that there may be at least three impulse reactors. The Constellation herself did not have any large apertures visible in the shots from the rear, but assuming that not all of the reactors were functioning one would presume that more than two existed. In any case, we have a lower limit of 195 megatons from the overloading of the Constellation's engines, and a probable upper limit of a gigaton or so. Second, it is commonly assumed that the Constellation was supposed to be completely destroyed by her overloading impulse engines. However, this assumption is only an assumption, and one which makes no sense. This is especially true in the case of those who believed that only 97.835 megatons was released in the overload . . . starships of a century prior had photon torpedoes estimated to be in the range of 20-40 megatons (as noted on the "Rise" page). The ship was rammed into the energetic glowing doodad within the maw of the planet-killer, and her engines overloaded while there. While we can certainly assume that the already-weakened Constellation would not have been any prettier after having her impulse engines overloaded, we have no reason to assume any particular level of damage from the event. There is no indication from the dialog that the overload would destroy the ship completely. The release of hundreds of megatons from the overload may have blown the ship to little tiny bits, or it may have simply gouged additional holes into the saucer. We don't see it happen, so we don't know for sure. However, we do see the exterior view of the planet-killer's deactivation. It certainly indicates that more than a mere couple of hundred megatons of energy release occurred . . . just observe the volume of the vast jet of matter expelled from the maw at high velocity. The jet continues for almost two seconds . . . one would be hard-pressed to explain the profound volume of material as being from the Constellation. 5. 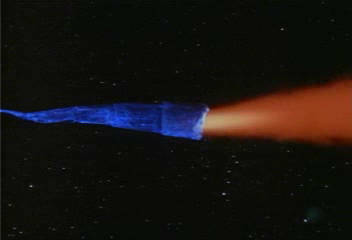 Shouldn't this energy dampening field that the Doomsday Machine put out have affected the Constellation's explosion? That makes no sense. The Constellation engine overload occurred well inside the maw, near the glowing object (presumably the converter for its total conversion drive). For the dampening field to have affected the explosion, we would have to assume that this field extended within the vessel, as well as outside of it. I, for one, would be curious to know why the designers of the Doomsday Machine would have it dampen its own energy in addition to that of its opposition.